Each Monday, the Kenosha News takes a look at the life of a Kenosha County resident who recently died. We share with you, through the memories of family and friends, a life remembered. Career public servant Fred Patrie was a hub. At the center of things, Patrie kept things moving along, from facilitating post-industrial regrowth of Milwaukee’s west side to championing building projects, bike trails and commuter rail in Kenosha County. In a 1988 interview with the Milwaukee Journal, Patrie described the life of a public administrator: “You are at the hub of a wheel; there’s lots of spokes pointing at you.” Patrie thrived in this capacity, said his brother, Paul. “He loved being at the center of forward-thinking people.” “(Patrie) was the main cog in the machine,” noted Ed Quandt, retired fire chief from West Milwaukee, former interim administrator of West Milwaukee and longtime friend. On a personal level, Patrie was also the center of his wife’s world. “We were soulmates,” Melody Patrie said. At 62, after a brief illness, Patrie died on Sept. 6 in his Kenosha home. His survivors include his wife; brothers Paul (Janice) Patrie and Ed (Judy) Quandt; sisters Carol Schmit, Pat (Greg) Keller, Mary (Dave) Wing and Lanny (Lonnie) Knoble; nieces, nephews and friends. Fred was born Dec. 16, 1951, in Eau Claire, the third-oldest child of Frederick and Verna Patrie. He grew up in La Crosse and received a bachelor’s degree in economics and business administration from the University of Wisconsin-Parkside in 1974. Patrie stepped into the public arena after attaining a graduate degree in public administration at Kent State University in 1976. Over the next 15 years, Patrie was an administrative intern in Akron, Ohio; budget and management analyst for the Wisconsin Gas Co.; administrative officer for Southeastern Wisconsin Regional Planning Commission; and village administrator for the village of West Milwaukee. Melody Fohr met Patrie when she went to work at SEWRPC in 1978. She was taken by his ability to lead by example. The two became friends, marrying on June 10, 1986. Lanny Knoble said she appreciated her older brother’s counsel when she lost her job in 2009. Patrie prescribed a road trip for them, during which he gave her life-changing advice about exploring new directions, she said. In the 1980s, he was an adjunct instructor in public administration at Parkside. Among his students was County Executive Jim Kreuser. “Fred was always good at translating information and kept the interests of the public before us,” he said. Fred Patrie retired as public works director of Kenosha County in June, 2008. 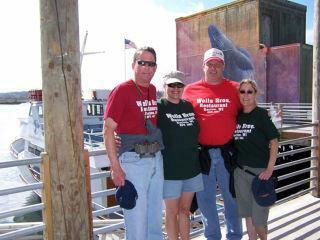 Fred Patrie, far left, vacationing in Oregon in 2007 with his wife Melody and brother-in-law and sister, Lonnie and Lanny Knoble.